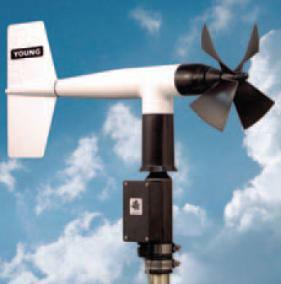 The wind speed sensor is a four blade helicoid propeller. Propeller rotation produces an AC sine wave voltage signal with frequency directly proportional to wind speed. Slip rings and brushes are eliminated for increased reliability. The instrument is made of UV stabilized plastic with stainless steel and anodized aluminum fittings. Precision grade, stainless steel ball bearings are used. Transient protection and cable terminations are in a convenient junction box. The 05103 mounts directly on a 1.0 inch IPS Schedule 40 (1.32 inch O.D.) pipe. Campbell Scientific supplies a 10-inch pipe for mounting the Wind Monitor as part of the 019WM Crossarm. An alignment ring maintains wind direction reference orientation during maintenance.